Striking, stocky squeakers. Common east of the Rockies in summer and migration; winters in Central and South America where they are commonly trapped as cage birds. Prefers a range of forest and semi-open areas; often attracted to feeders. 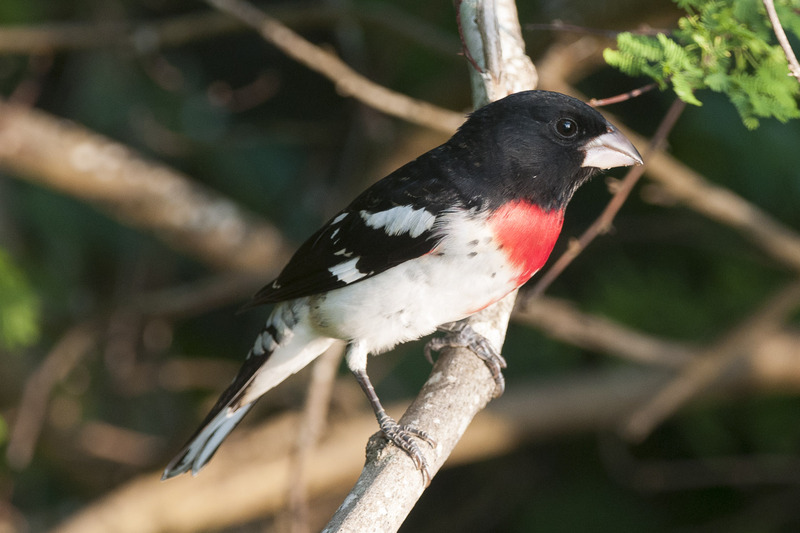 Mid-sized and stout, with a thick bill; white wing patches; males have black backs, white bellies, red breasts; females brown and streaked with a contrasty face patch. Distinct “chink” call sounds like a squeaky sneaker; song similar to American Robin. Feeds on a mix of insects, seeds and fruit. Often nest in edge habitats in the crotch of a sapling. Lifespan up to 12 years. Population ~ 4.1 million and stable.